A new development application has been submitted by Iglu, which plans to build a 414 bed, 23 storey student apartment tower at 65 Mary Street. 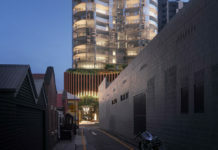 The project would become Australia’s third student accommodation facility under the Iglu brand with two other Iglu properties in Sydney. The architects behind this project are Batessmart Architecture. The proposed building will set a new benchmark for student accommodation in Brisbane. Students will enjoy accommodation with high levels of residential amenity and access to extensive communal facilities set within a sub-tropical garden. Pattern, texture and colour provide an animated architecture that enriches its surroundings and expresses the vitality of student life. The proposed 23 storey building consists of a 2-storey podium and a 21-storey tower. The tower accommodates 414 student bedrooms organised in a range of studio and 6 bedroom cluster apartments. The podium is 8.5m high and is set back 3m on ground level and built to the street frontage on Level 1. The podium accommodates a series of indoor and outdoor communal spaces designed to encourage interaction between students. Plant is located at the rear of the ground level and on the roof of the tower and is screened on all sides. To read more about the DA, enter the DA number (A003721161). Brisbane needs a few more sculptural pieces like this. This is a really ugly building. People will look back on this and wonder what were they thing back in 2013? Nick13, your pretensions of “architectural-mindedness” have been spotted! Maybe you’d prefer some of the already-constructed residential wonders of Mary Street?